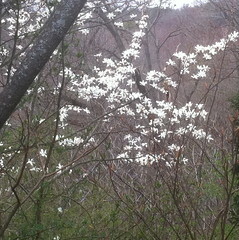 The magnolia tree is finally blooming! 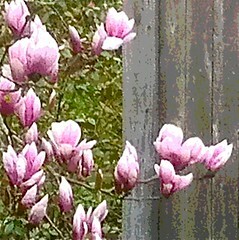 The blossoms looked great against the fence so I took some photos through the window. Later, I used Painter to crop and posterize the image. I also created a digital woodcut which I plan to publish here tomorrow. 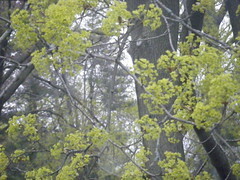 Here's another photo of trees leafing out. 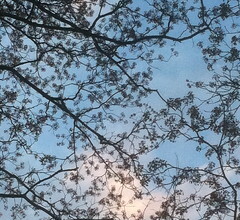 Tonight I noticed the tracery of the trees leafing out against the soft colors of the evening sky. I was in the driveway at the time, heading into the house. But I put everything I was carrying so I could look up and take some pictures with my iPhone. Later, I used iPhoto to crop this image from the best of the photos. Here's another photo that I took during a recent walk at Long Hill Gardens, here in Beverly, MA. The forget-me-nots are blooming all over the place. I liked the contrast of the early spring flowers coming up through the autumn leaves, so I took a picture with my iPhone camera. I cropped this image just a bit, but otherwise this is how it looked right out of the camera. Yesterday I published a photo that I took over the weekend: a white magnolia tree in bloom at Long Hill Gardens here in Beverly, MA. Tonight I posterized the photo to emphasize the pink haze created by the budding tree branches in the background. 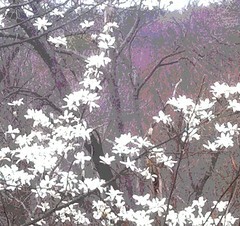 Then I cropped the image to emphasize the shapes made by the magnolia blossoms. Here in Beverly, north of Boston, the has gone from November to June and back to April over the past few days, resulting in rain, mist, and fog. Sunday's adventure was a trip to Long Hill Gardens, just up the road, to see what bloomed in recent warm spell. 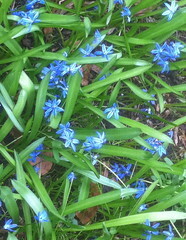 There were lots of daffodils and forget-me-nots in the garden, and I took pictures of them. But what I liked best was a magnolia tree just outside the gardens proper so I took a photo with my iPhone camera. Long Hill Gardens (aka Sedgwick Gardens) used to be a private estate, but now the house and formal gardens are open to the public. And it really is on a hill. This photo shows the view looking out into the distance. I liked the magnolia tree against this backdrop; some of the trees in the background create a pink cast because they are about ready to bloom. Tonight I cropped the original photo to get this composition. This is my oil bar painting of a path to the beach, based on a photo that I took at Lynch Park here in Beverly, MA (posted here April 15). In the past twenty-four hours, I have made a number of small changes. I added some blue to the sky, especially on the right side of the canvas. I also added some definition to the boats and adjusted some shadows, especially a shadow on the water that was very distracting. Now I am ready to call it: this is officially finished. 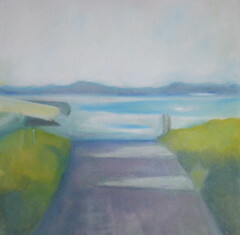 Today I worked on this painting of a path to the beach (based on a photo that I took at Beverly's Lynch Park). First, I adjusted the line at the end of the path to correct a persistent optical illusion that made it the line look crooked even though my trusty T-square said otherwise. (I fixed this by over-correcting the line, tilting it slightly in the opposite direction.) Then I continued to work with my T-square and a brush to add lines in the water and make sure the horizontal lines were parallel. Then I corrected the shapes of the boats on the left side and added color to them. I also added yellow to the highlights on the path and to the grass, and also added some subtle touches of red to the grass, to bring the colors of the boats into the rest of the painting. Then I worked on the texture of the sandy path, working closely from the reference photo (posted here April 15) as I added shadows in shades of purple. Finally I added subtle touches of blue to the sand, tapping on some blue with my fingertip (leaving fingerprints instead of footprints). I think this is painting is finished, or close to it (which is good because I need to get everything ready for the art show). There might still be changes, but if so, I think they are likely to be small. I worked on this painting today, an oil bar painting based on a photo that I took of a path to the beach near Beverly's Lynch Park. 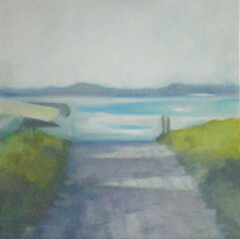 Today I changed the shape of the hills in the distance and then started correcting the colors, especially on the path. As I made changes, I had to be very careful because the least little thing can throw the perspective off. 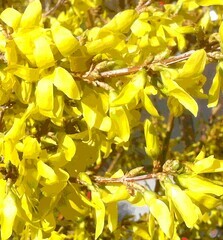 Forsythia is blooming all over town! All the bright yellow flowers everywhere make it look like a celebration. This image started with a photo that I took a few days ago, during a neighborhood walk. I transferred the image from my iPhone to my computer, and then used Painter to posterize it. In the original version, there was just one tiny spot of bright red (a glimpse of a car in the background, I think). But I liked the touch of bright red against all that yellow, so I added a few more touches of red, about the same size, using some digital pastel. Can you find them? They are very small. This is a very subtle difference, but I think those little touches of red help to balance the color and the composition. Here is my oil bar painting in progress as it looked after I worked on it today. 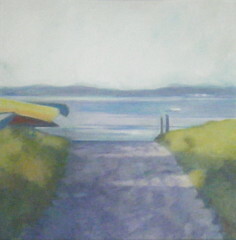 This view of a path to the beach is based on a photo that I took here in Beverly, at Lynch Park. (You can my reference photo, posted here on April 15.) Now that the basic shape of the path was in place, today my goal was to soften and break up the borders between the path and the vegetation, in order to show the incursions of sand into grass and grass into sand. As I worked, I tried to figure out what makes a path read as "sandy" when we look at it. This is an interesting problem to me, because I don't have much experience painting sand. (I'm from Colorado and still see the ocean as exotic.) I tried to suggest a little texture on the path, and I also worked on the vegetation in the foreground to try to make it relate to the path. And then it was time to stop for the day. 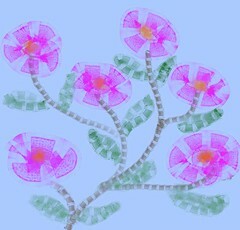 This afternoon, I used Painter's pattern pen to create this little floral fantasy for Passover. Why are these flowers different from all other flowers? If you look closely, you will see that they are made of matza! Last year I used Painter's "capture pattern" function to create a pattern from one of my photos, which was just a picture of a piece of matza. Simple, but it makes a nice pattern. I plan to send this spring-time image out with holiday greetings for Passover. 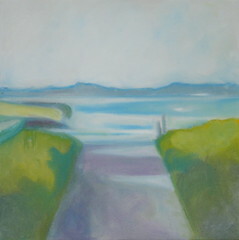 This morning I worked on this oil bar painting of a path to the beach. I am working from a photo that I took at Lynch Park a few years ago. (I recently published a posterized version of the photo on this site on April 15.) Today my goal was to widen the path and give it a little curve, as in my reference photo. Well, making the path wider was pretty easy; I just had to move the boats and the posts on the sides. But adding a little curve to the path was very tricky and I had to struggle to get that path to do what I wanted it to do (and not behave like a roller coaster). It was worth the effort, though. If the perspective of the path is "off" in this painting, nothing else is going to work. At this point, I am satisfied with the basic shape of the path. Later I will soften the edges of the path and add texture to indicate that it is sandy. This morning I started another oil painting, working from a reference photo that I took back in the summer of 2007, a view of a path to the beach at Lynch Park, here in Beverly, MA. (Yesterday I used Painter to created a posterized version of the photo and published it here.) This morning, I planned to begin by printing out a copy of the reference photo from my computer, but the printer's nozzle for blue ink was clogged, so I got a print-out of the photo with only red, green, and yellow. A little basic printer maintenance allowed me to print the 'full-color version' five minutes later. But I also kept the first "problem" version because I can use it as an aid to color analysis later on. Before I even started, I knew I wanted to change the photo's composition for this painting, not just to get it into a square format, but to make some minor placement adjustments. So I was folding the printout and drawing on top of it till I knew what I wanted to do. When I was ready, I picked up a gray oil bar and sketched in a basic composition on the canvas. I used my T-square with the oil bar to make some corrections, and kept making lines with dark and light gray paint. When I started to get lost, I added some color to make it easier to see what I was doing, but I wasn't worrying too much about whether the colors were "right" or whether the shapes were completely accurate. I was just trying to establish basic placement of shapes. I worked for about an hour and got the composition roughed in. I can already see lots of things that I want to modify, but I had a good time and I am glad I got this painting started. 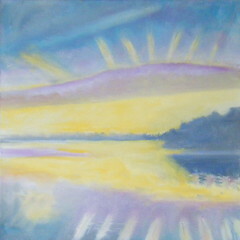 I am thinking about trying to fit in one more oil bar painting for my show in Beverly Farms, but timing is very tight. (The show starts May 1.) For a few weeks now, I have had an image in mind for another painting, a photo that I took a few years ago of a path that leads to the beach at Lynch Park, here in Beverly. (I posted a version of the photo here back on July 21, 2007.) Today I used Painter to posterize and crop that photo to see if I could come up with a good composition and the image you see here is the result. I think this would work for a painting, though I might modify the placement of some elements just a bit. Although life is busy enough, and I need to work on getting art ready to hang, I will probably try to start another painting to see how far I can get with it. Here north of Boston, signs of spring appear first at the supermarket, when it is finally warm enough to set up displays of flowers outside the store. 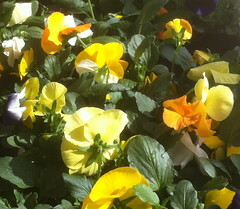 Today I saw that a big display of pansies so I took some pictures. Tonight I cropped this image out of one of the photos. I finished this painting today, a view of an amazing sunset inspired by a photo that I took last August (posted here March 28). I had planned to make only one change today: to make the boat on the left a bit darker. But I made a few other changes as well. I added some dark blue lines and shapes to add depth and perspective to the shoreline in the distance. Then I made a few other very minor modifications, including softening the transition of the rays of light to the sky. Tomorrow I will send a jpeg of this painting off to be used to publicize my art show in May. This is an oil bar painting, almost finished. The scene is the view west over the water at sundown. My reference is a photo that I took last August from Obear Park in Beverly. Today my focus was on the shoreline. First, I added some detail to the shape of the shoreline over on the left side of the canvas. Then I added suggestions of lights along the shore, especially a couple of bright spots of light near the edge of the canvas. And I added a gentle suggestion of a boat, again on the left side of the canvas. Although there are several boats in the reference photo (posted here March 28), I only added one. I added these small details not because I am trying to make the painting realistic but because I think they help balance the composition by drawing the eye to the left, and that's important with the land mass over on the right. I used a fairly light color to suggest the boat. I'm going to let this sit overnight and if I still like the placement tomorrow, I will make the boat darker. And then I think that will be it. Although I made a few other very small modifications this afternoon, I began to get that nervous feeling that I stand to lose more than I gain by making changes. It's important to be aware of that feeling. It tells you when to stop. Here is the oil bar painting I have been working on, as it looked when I finished painting for today. (I am using a photo that I took last August as a reference for this painting, a view of the setting sun from Obear Park, here in Beverly, MA. The photo was posted on March 28.) This afternoon, I was still not happy with the way the light rays above the cloud formation were lining up with their reflections in the water. This time, I turned the canvas (and the reference photo) sideways, and looked hard. 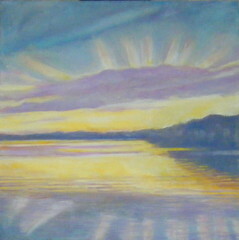 Then I used a brush and my T-square to correct the placement, making some adjustments in sky and water. Then I returned the canvas back to its upright position, and worked a little bit on the sky, but mostly worked on the water in the foreground, added marks to suggest gentle waves on the water's surface. Then I worked on the land mass, using shades of dark blue and purple. I used some brush strokes to suggest buildings on the shore. And then it was time to stop for today. Although there are small changes still to be made, I think this is getting pretty close to finished. Good thing, to, because I plan to use this image to publicize my art show (coming right up in May), and I need to e-mail a digital image of this painting later on in the week. This is digital art, an illustration that I created from (digital) mixed media. I made the original version back in 2005. I started with everybody's standard photo of the Hollywood sign. 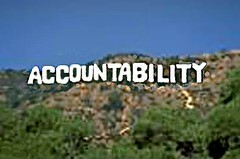 Then I used Painter to do some cut-and-paste and hand-lettering to change "Hollywood" into "Accountability". (The point was that "accountability" had become an icon.) 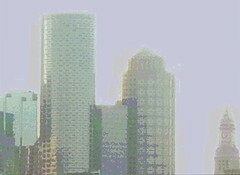 Since 2005, this image has served as a profile picture and as a logo on a web site. This morning I had to get it ready "for the big screen": not as in Hollywood silver screen, just a power-point presentation at a conference. This wasn't an easy task because the image was at such a low resolution that it would look too blurry in a slide presentation. So I opened the older version in Painter and after some trial and error, came up with a quick solution (quick so as to be done before the flight to the conference). I used the selection tool to sharpen the image of the sign and the hillside, and then I posterized that same area. Then I softened the focus of the sky, to get rid of pixilation markings. Despite my standard complaining about "the role of the artist in American society," I've grown fond of this image. And as they say in Hollywood, it's good to be famous. Today I worked on this oil bar painting. I am using a photograph that I took last summer as inspiration and reference. (The photo is posted here on March 28.) Today I kept going with issues of placement and perspective, and again worked mostly on the lower part of the painting. I started by turning the painting on its head, like yesterday, to compare some of the shapes with those in the photo (also turned upside-down). I made a few corrections to some of the shapes to correct the perspective. 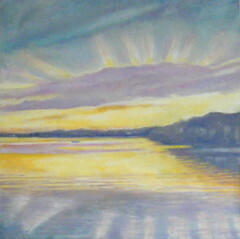 Then I turned the canvas (and photo) right-sight up again and started to work on the water. I went to the printout of the reference photo and drew some pencil lines on top of it, tracing the angle of the waves on the water's surface, to better understand where the lines went and how things connect. Then I used my big old T-square and a brush to lightly paint similar lines in the foreground of the canvas, to set up an analogous spatial relationship. With that structure in place, I drew in more lines to begin to suggest the surface of the water. I had to stop at that point, but I am beginning to feel like I am getting somewhere with this. This is an oil bar painting in progress. I am working from a photograph that I took last summer of an amazing sunset, seen from Obear Park in Beverly's Ryal Side neighborhood. (The reference photo is posted here on March 28.) Today it was a real struggle to find any time to work on this at all. Since time was short, I decided to focus on placement of the reflections in the water. I also decided to turn the canvas upside down (and turned the reference photo upsidedown as well.) Sounds like a crazy thing to do, I guess, but I usually do that at least once in the painting process. Well, of course it is easier to paint the bottom part of the canvas that way. But the real reason I do it is that it is also a great way to check what I am actually seeing against what I think I am seeing. With the canvas upsidedown, I took my big T-square and worked on getting the reflections of the light rays in the water to line up with the corresponding rays of light above the cloud formation. In the process, I worked a little bit on both areas. And then I had to stop. But I am glad I made a little bit of progress today. Today's adventure was a late afternoon trip to Boston for dinner with a friend who was staying at the Westin near the seaport and the ICA. The light was good and the view of the Boston skyline was great, so I used my iPhone to take some pictures during a walk from the hotel to the restaurant. When I got home tonight, I cropped this composition out of one of the photos. Then I used Painter to apply some color overlays and some selective posterizing to get the effect that you see here. This is an oil bar painting in progress, a picture of the sunset over the water. I am working from a photograph that I took last summer, a picture that I took last August of an amazing sunset. 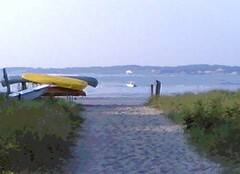 The vantage point was Obear Park here in Beverly, MA, looking west. (The reference photo is also posted here, March 28). I am still refining the basic composition, but today I also started working on the colors and shapes in the cloud formation and in the sky. I added some subtle diagonals to the cloud formation, and modified the colors to make the rays of sunlight seem to blend into the sky. It is a challenge to paint this scene because it needs to look amazing and believable at the same time! Here is the oil bar painting I have been working on as it looked today, which is day 5. 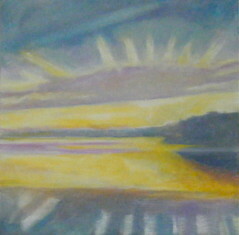 I am trying to paint an amazing sunset that I saw last summer from Obear Park here in Beverly, MA. I took photos of the sunset in August, and I am one of them as inspiration and as a reference as I paint. (The photo is posted on this site as well.) This morning I kept going with the basic layout of the canvas, concentrating on perspective. I started by taking out a ruler and measuring some shapes on the photo (printed out from the computer) and comparing the relative measures to the canvas. Then I took a triangle and pencil and drew lines on the computer print-out of the photo to get a better handle on the perspective, especially the direction of the rays of light above the cloud formation. Then I took a white oil bar and drew similar lines on the canvas, drawing right over the painting, and also drew white lines indicating changes to some of the other shapes. Then I painted in the revised shapes, worrying more about value than color, and covering up my white guide lines as a worked. There is no point worrying about the details before I have everything in the right place. I have more work to do but I needed to stop, not only because I ran out of time today (which I did), but also because I want some of the darker paint to dry before I add lighter colors to the canvas. 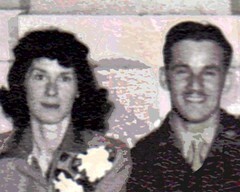 This is a digitally modified photograph of my parents on their wedding day, April 4, 1943. This was the at the lunch (at the Vail Hotel) following the wedding. In the original image, an oversized group shot of the luncheon and the guests, you can hardly see my parents, in the top corner of the photo. The original photo is great, but I wanted just my folks, so I scanned the image in and cropped it. Then I opened the image in Painter and went to work. I had to do some cut and paste to cover up a large woman's hat that was covering part of my dad's coat. Then I did some selective color overlays and posterizing till I had what I wanted: which is this, just my parents, newly married, on their wedding day. This is an oil bar painting in progress. I am painting a scene that I photographed last summer, a view of the sunset from Obear Park, here in Beverly. (That photo is inspiration and reference for this painting. I posted the photo here last week, in case anyone wants to see.) So this is the painting as it looked on day 4 (which was April 2). I am still working getting everything in the right position. With the small amount of time that I had to work yesterday, I concentrated on moving the cloud formation and light rays further down on the canvas to make room for some diagonal streaks of clouds in the sky. I also modified a shadow in the water to create a diagonal line that will eventually align with a ray of sunlight in the sky, as in the photo.) I still have lots of changes to make, but once I am happy with the composition, I can focus on color, value, and depth. 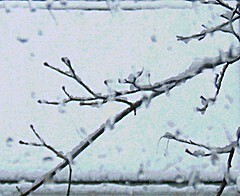 I used Painter to make this posterized version of yesterday's post, a picture of the snow on April 1. 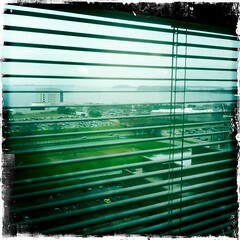 Although this photo has been digitally modified, it really did snow here yesterday. No joke. No foolin', it really did snow here last night. I took some pictures this morning. I took this photo through a window, a snow-covered branch against a snow-covered roof. Later, I used Painter to sharpen the focus and clean up a few distracting marks. While I was at it, I created a posterized version, which I plan to post tomorrow.